Ingram Enterprises, Inc. || Jewel "T"
Jewel "T" doing a typically spectacular launch on a testing day. And now we can see it go! ...As appeared in 1967 Car Craft Magazine. Wes works on the engine while Joe Davis sits in the catbird's seat. I was barely 20 when I teamed up with the late Joe Davis one of the nations top 10 drivers at the time with an incredible win record. 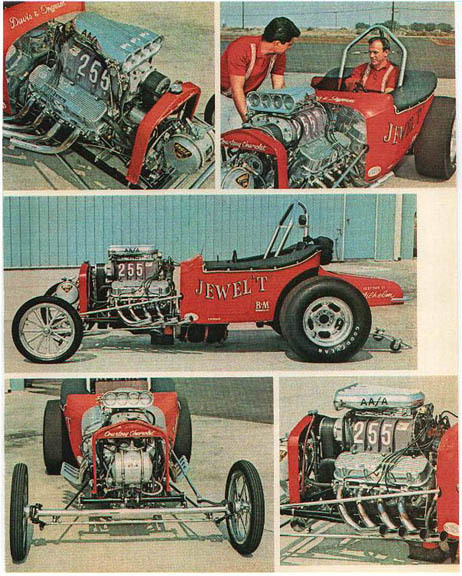 I was hell-bent on setting national records (we had at least 5) and I always built cars that would also be show stoppers. You could do that in drag racing since the cars only ran 1320 feet per race and the remainder of the time you were in the pits surrounded by race fans. It was a different world, a bit glamorous, cameras, big magazine articles and good looking women. Between races you had to learn to wrench, solve problems and get back to the starting line, sometimes with seconds to spare in spite of all the distraction in the pits. 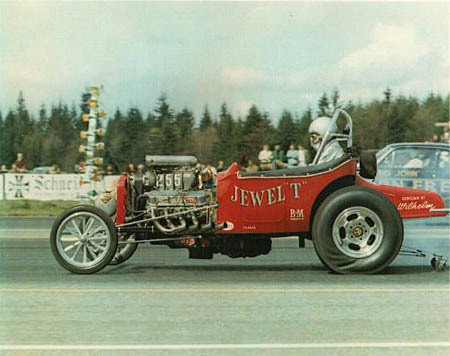 Jim Walraven forwarded this fact sheet about the Jewel "T"s performance. 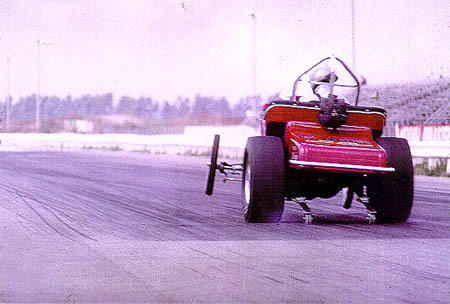 Although those 1/4 mile times were national records back in the mid-60's they would be slow compared to todays records. In case you missed the YouTube link above. This came to us from Bryan Billings.